GreyLit was developed by professionals who are passionate about knowledge mobilization, information dissemination, closing the evidence access gap and not re-inventing the wheel. Our goal is to create a platform that allows collaboration, sharing of content and communication with people who want to move research forward by applying it to their work. We respect and appreciate all of the hard work that went into creating the intellectual property shared on GreyLit, we expect you to do the same. GreyLit's mission is to allow grey literature to be searched, shared, reviewed and collaborated upon around the world, nearly instantly. In order to do that, registered Members must share their professional identities and credentials. GreyLit aims to connect readers to research/information. Therefore, it is essential that researchers identify themselves using their real names and their affiliation. GreyLit provides members with the ability to search, share, review and collaborate on, articles, data, text, photographs, images, illustrations, or other information on our platform. Some content is also visible to unregistered and logged-out Users ("Visitors"). The GreyLit platform largely consists of information uploaded by and/or stored upon the request of Members. We do not preview or review or filter such information, neither manually nor automatically. Therefore, we do not and cannot have current knowledge of possible infringements, inappropriate content, or violations of law caused by information that is uploaded by and/or stored upon the request of Members. We are not liable for such information. As a member, when you post information or material on GreyLit, you do not transfer or assign copyright to us, you are simply making information available to the public through GreyLit. You retain the right to remove such content from GreyLit at any time, or to archive your content so it is available only to you, your co-author(s) and other folks you decide to share it with. Our platform enables a private and public posting of various types of content. You can choose to post privately or publicly each time you upload your information. As we do not have any information about the rights you may hold, or any license terms or other restrictions which might apply to your content, we rely solely on you to understand your rights and act accordingly. For this reason, we request that you fully investigate and confirm that you have sufficient rights to post particular content to GreyLit before you do so. If you're are unsure about what you're allowed to share on GreyLit, we recommend that you get in touch directly with your publisher. There are other resources available that you might also find useful in understanding your rights, such as How Can I Share It (howcanishareit.com). Of course, we have a process for submitting complaints about copyright or intellectual property right infringement posted by our members. In the event of a complaint, we will forward your written notification, including your contact information, to the member who posted the content to notify them that we have received notice of an alleged violation of copyright or intellectual property rights. Please also remember that, if you choose to request removal of content by submitting an infringement notification, you are initiating a legal process. Any notice or counter-notice you submit must be truthful and must be submitted under penalty of perjury. A false notice or counter-notice may give rise to personal liability. You may wish to seek the advice of legal counsel before submitting a notice or counter-notice. It is our policy to respond to notices of claimed copyright infringement submitted by rights owners in accordance with the notice and takedown procedures found in section 512(c) of the Digital Millennium Copyright Act (United States) and the European eCommerce Directive, detailed below. 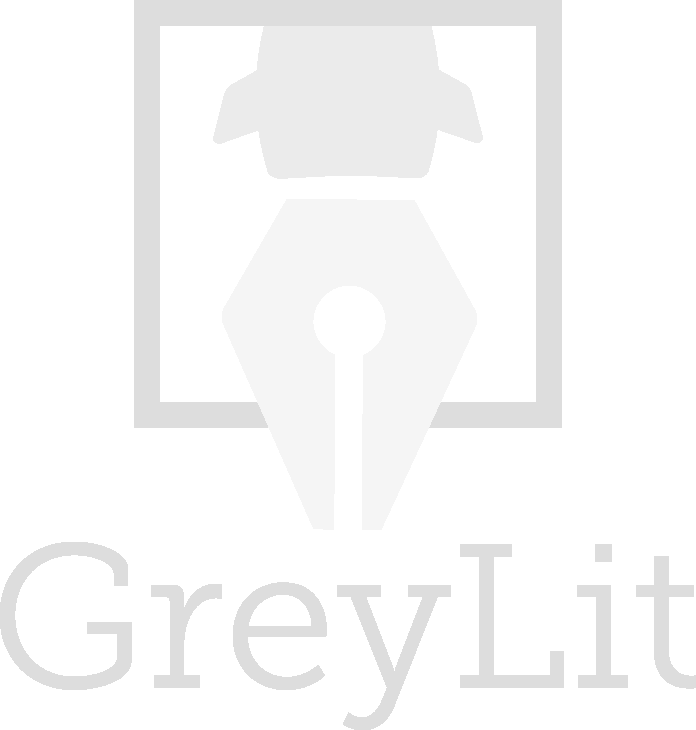 If you do not wish to use our form, you can send an email to info@GreyLit.net, so long as it contains all the required, following information. The name, address, telephone number, and e-mail address of the complaining party. A description of the copyrighted work(s) or other intellectual property claimed to have been infringed and the country of claimed rights. A description of where the allegedly infringing material is located on GreyLit, with information sufficient to permit us to locate the material. In order for us to be able to accurately identify and remove content notified to be infringing, it is necessary to provide the specific URL for the actual file and not the URL of the publication page where the file is displayed, as the content displayed on a publication page can change. You can identify the URL of a particular file by clicking on the downward-facing arrow at the top-right corner of a publication page, selecting "Full-text sources," right-clicking on the respective download button of the file and copying the link address. A statement that the complaining party "has a good faith belief that the use of the material in the manner complained of is not authorized by the copyright owner, its agent, or the law." A statement that "the information in this notification is accurate, and under penalty of perjury, the complaining party is authorized to act on behalf of the owner of an exclusive right that is allegedly infringed." An electronic or physical signature of the person authorized to act on behalf of the owner of the copyright or other right that is allegedly infringed. We require a signature and information about you or your company that we will keep on file. Note: If you are asserting infringement of an intellectual property right other than copyright, please specify the intellectual property right at issue (for example, "trademark"). Upon receiving notice of a claimed infringement that complies with the above requirements, we will expeditiously remove or disable access to the allegedly infringing material and will notify the member who posted it. At that time, we will also provide the member with an email address which may be used to contact the complaining party with any questions, or if they think a mistake has been made. In accordance with applicable law, we have a repeat infringer policy that provides for the disabling of a member's uploading rights or termination of their membership in appropriate circumstances. GreyLit recognizes that sometimes content may be mistakenly identified by a rights owner as infringing their rights. In the event such a mistake occurs, you should first contact the complaining party directly using the email address provided to you. GreyLit will allow you to re-upload the content upon receipt of an acknowledgement of the error from the complaining party. If the complaining party does not agree that their request for removal was in error, you may submit a counternotice using this Counter Notice Form. A statement that you consent to the jurisdiction of Federal District Court for the judicial district in which your address is located, or if your address is outside the United States, for any judicial district in which GreyLit may be found, and that you will accept service of process from the party who submitted the notification of claimed infringement or an agent of that party. We will not be able to consider your counter notice unless you fill out the form in its entirety, and physically sign it. Please make sure that the counternotice you send to GreyLit is legible; if we cannot read your handwriting we will not be able to process it. Upon receiving the original of your fully completed counternotice, GreyLit will provide the complaining party with a copy of your notice. We will also inform them that we will allow you to replace the removed material after 10 business days unless GreyLit receives notice from the complaining party that it has filed an action seeking a court order to restrain you from engaging in infringing activity relating to the material on GreyLit. If the complaining party notifies us in writing that they no longer object to the material being made available, we will allow you to repost it.